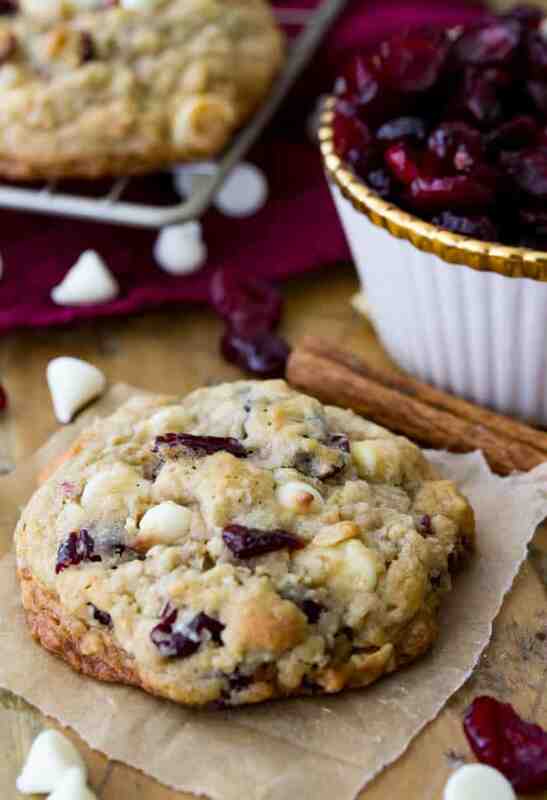 Big fat white chocolate cranberry oatmeal cookies! 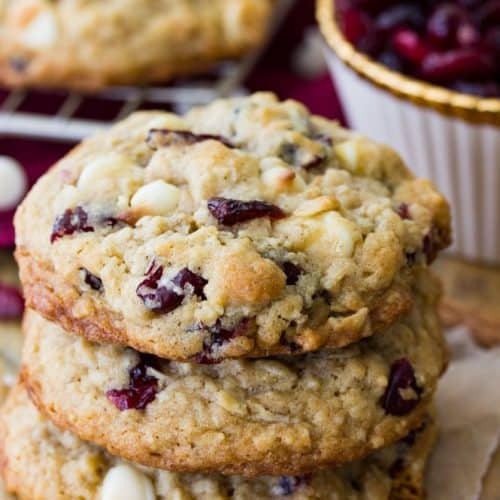 The name pretty much has it covered — thick cookies with slightly crisped exteriors and soft chewy center, loaded with sweet white chocolate chips and dried cranberries and made with pulverized oats. These cookies have the best texture, and their flavor is unforgettable! Zach asked me to make this recipe for him a while ago after tasting them at a work lunch. I dutifully wrote down all of the cookie qualities that he asked for: cranberries, white chocolate, soft and chewy interiors, and oats, but without an overwhelmingly “oaty” (!?) texture. I then proceeded to skip right on past that recipe request for the next year and a half. Yup, a year and a half. You’d think that with all of the baking that I do every day my very own husband wouldn’t need to wait 545 days or so for such a simple request, but here we are, and when I told him that I’d finally made these white chocolate cranberry oatmeal cookies for him, he had literally no idea what I was even talking about. Fortunately, that didn’t stop him from inhaling a dozen of them still warm (and commenting that they would be great with some nuts added, which were definitely not on the original request list!). Most of the qualities that he had requested were easy enough to match. 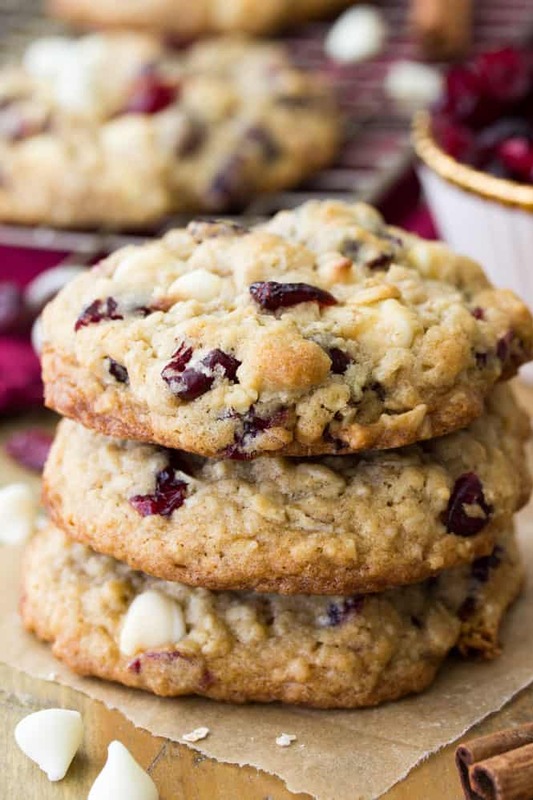 I started by making my favorite oatmeal cookies and added the cranberries and white chocolate chips, but I found that the texture was definitely too “oaty” (I spent a long time pondering over this word, and have resolved to now leave myself better notes moving forward). I wanted chewier cookies that complemented the abundance of add-ins that are included here without competing against them. I like a cookie with texture, but my first few batches were definitely too much and almost seemed like I was biting into a granola bar rather than a cookie. I finally found the perfect way to include oats by pulverizing them in my food processor for a few seconds before stirring them into the dough. This gave the cookies a perfect texture — you won’t want to process them to pure powder, but add them to your food processor and just pulse for about five seconds until they’re mostly broken up (finer than instant oats, but not completely pulverized, see the picture above). Make sure that you chill this cookie dough before baking. Chilling will keep your cookies from spreading too thin, I like to chill them and then bake on 375 (as opposed to 350, which is the temperature I use for many of my cookies) for thick, fat cookies. 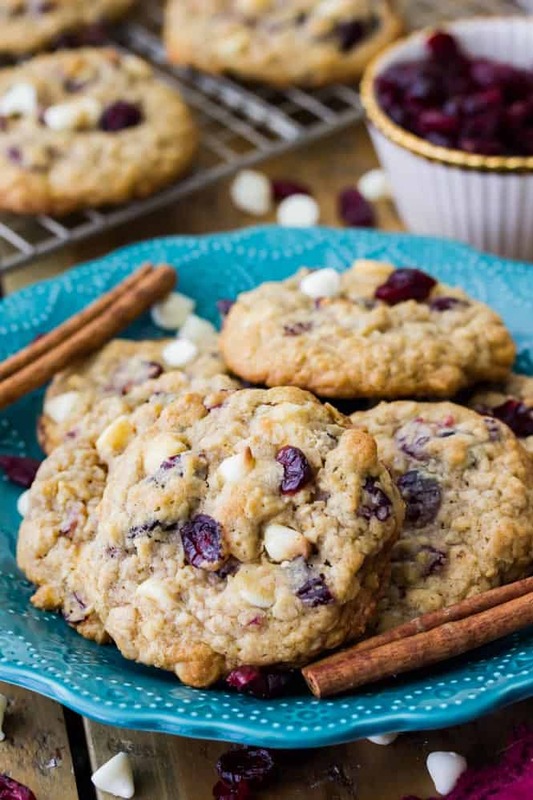 Chilling also gives the flavors a bit of time to begin to really meld together, there’s a small amount of cinnamon sprinkled into the dough that gives these white chocolate cranberry oatmeal cookies a subtle spice. Can I just say that I know I’m getting way ahead of myself right now, but I really think these would make great Christmas cookies. Make them today, but make sure you save the recipe for the upcoming holidays, too! Just a heads-up that I’ll be going Live on my Facebook page at 12:00 EST tomorrow and would love it if you could join me! Thank you to everyone who tuned in for last week’s Live where I had my special guest, Andi — I’m hoping I can convince her to help me again this week! 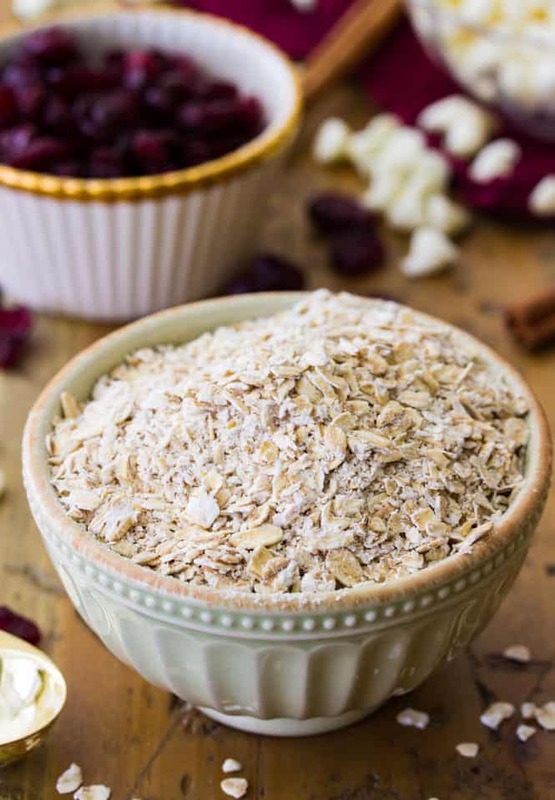 Place your oats in a food processor and pulse about 5-10 seconds. Set aside. Gradually stir in oats until completely combined. 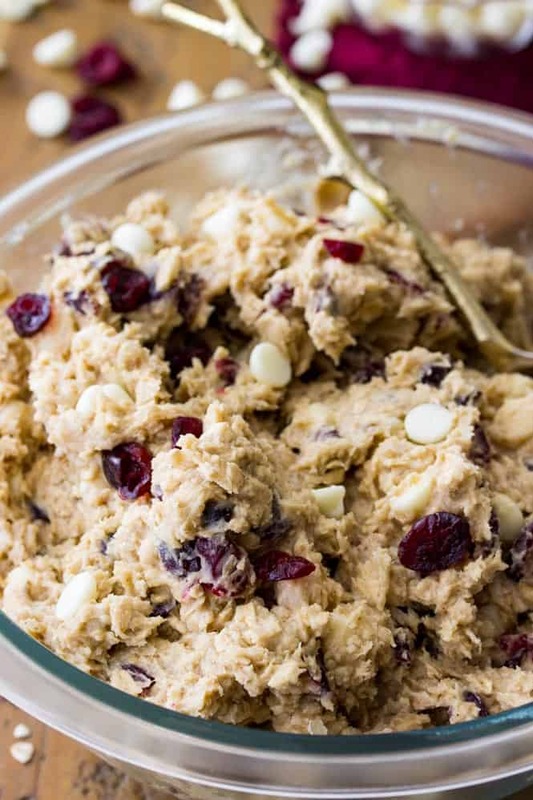 Add white chocolate chips and cranberries and stir well. Preheat oven to 375F (190C) and prepare cookie sheets by lining with parchment paper. Drop cookie by rounded 2 Tablespoon-sized ball onto parchment paper, spacing at least 2" apart. Allow cookies to cool completely on cookie sheet before serving and enjoying. Love your cookies! I’ve made them twice now. The second time I added walnuts. Great recipe! Thanks again! This was a HUGE hit and is now part of my Xmas cookie repertoire! I’m so happy to hear this! Thanks for letting me know how they turned out, Lisa!! I followed the recipe to a T. They taste great but have a texture that reminds me more of a cake or a soft biscuit…any suggestions??? Hmm, could the flour be over-measured, by chance? Are you using weights or cups? If using cups, stir the flour, spoon it into the measuring cup and then level it off, never scoop the flour directly into the cup. I hope that helps! These look amazing! I don’t have a food processor, though. Think I can skip that step? I think that will work! You could also try my regular (no food processor required) oatmeal cookie recipe and stir in the add-ins at the end. Enjoy! Hubby and I absolutely loved these cookies. I will definitely make again and again! These cookies were absolutely delicious! My hubby loved them so much I had to take them away because he over did his limit! Thank for the recipe. Did you ever make them with nuts? If so, did you change anything? The consistency of the dough is very sticky. Is that normal?